Conservatories are hot during the summer, we can all agree on that. So why not do something about it by investing in some air con? If you’ve recently added a conservatory to your home, you’ll want to be able to enjoy it all year round. When the recent hot weather hit the UK though, your conservatory may have felt more like an oven than an oasis of calm. Unfortunately, conservatories are vulnerable to the ‘greenhouse effect’, and can heat up very quickly. So how can you bring the temperature down to something a little more comfortable? Well, bringing in some air conditioning is the best option. 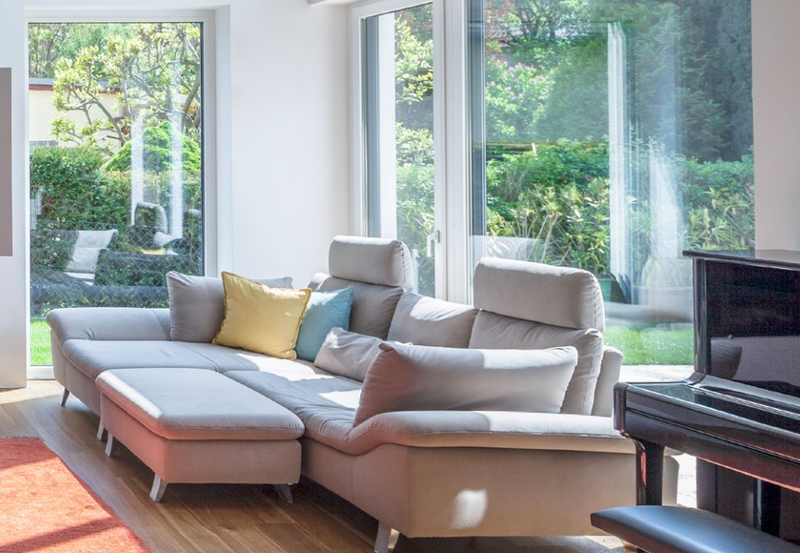 It’s notoriously hard to regulate the temperature in a conservatory, and even with some excellent new glass technology from Solarlux and Internorm, conservatories will still feel a little too warm on the hottest days of the year. When there’s a lot of glass present, light streams in and then gets trapped as heat. By installing some air conditioning though, you can keep the temperature at a reasonable level. It’s tempting to head outside in the middle of the day, but exposing yourself to the sun during these hours can be a little risky – particularly if you’re fair skinned. So it’s only natural that many people want to relax in their conservatories instead. Thanks to that greenhouse effect that we spoke about though, the room can quickly become unbearably hot. So even if you aren’t burning, you’re likely to feel warmer in your conservatory than if you were outside. That’s where air conditioning comes in. it won’t make the room feel cold, but rather keep the room at a comfortable, even temperature. So you can relax in the sunshine without frying in it! There’s nothing better than enjoying a meal as a family on a warm, summer’s evening – and the conservatory is the perfect location for that. However, thanks to the extra hours of sunlight, they’re still going to be very warm even during the latter part of the day. With a good air conditioning system though, everyone can sit down to enjoy their meal in complete comfort. So which air conditioning systems are best for conservatories? The Electrolux Portable Air Conditioner can be moved around easily, but is powerful enough to cool a hot conservatory down in minutes. It also cuts out when the room reaches a comfortable temperature, starting again if the heat begins to rise. The Igenix Portable Air Conditioning Unit has rave reviews too. It’s remote control powered, so you don’t have to get up to cool the room down or turn it off. It also has an A energy rating, perfect for those who want to keep an eye on household bills. You should be able to enjoy your conservatory all year round, not just when the temperature allows. By investing in some air conditioning, you’ll no longer be exiled from the conservatory in the summer months. Yes, we don’t have extremely warm weather all year round in the UK – but you should be prepared for when we do. So the next time a heatwave hits, you’ll be able to enjoy the sunshine in your conservatory and keep cool.